Flemming Rasmussen hails from Denmark. In 1999 he set the loglift record at 177.5 kg. Before becoming a proffesional strongman man Flemming Rasmussen was the Danish 10 pin bowling champion. Flemming is very strong in the upperbody. In a contest held in Dubai he set a loglift record of 177.5 kg. That record stood for sometime before Svend Karlsen beat it in 2002. 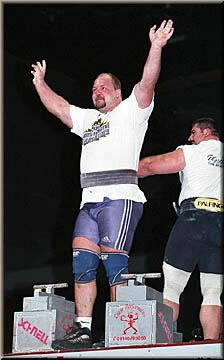 In 1997 Flemming nearly won World's Strongest Man. He only stumbled in the last event which cost him the title. In 1998 he was a top contender for the title again but fell prey to food poisoning before the finals began. 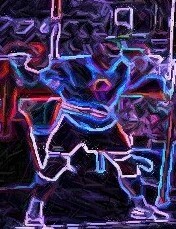 After that he left for the fledgling strongman organization known as The Full Strength Challenge. He did very well in the short lived organization, becoming the champion in 1999 beating the likes of Magnus Ver Magnusson, Riku Kiri, and Heinz Ollesch to name a few. Flemming is a laidback guy. He can usually be seen in the background cracking joke with the other strongman when he isn't performing a event.